Iron Chic have been around for a decade now. And in those ten years, they’ve released a prolific amount of music. Now on their third full-length and first for Side One Dummy Records, Iron Chic have continued their steady and understated rise as one of punk’s most authentic and endearing bands. You Can’t Stay Here doesn’t simply pick up where their previous releases left off. Rather, it shows the band moving into more mature and melodic sonic areas. This past year has also seen Iron Chic take their DIY ethic to bigger stages, having completed runs with Propagandhi, The Movielife, and Off With Their Heads. 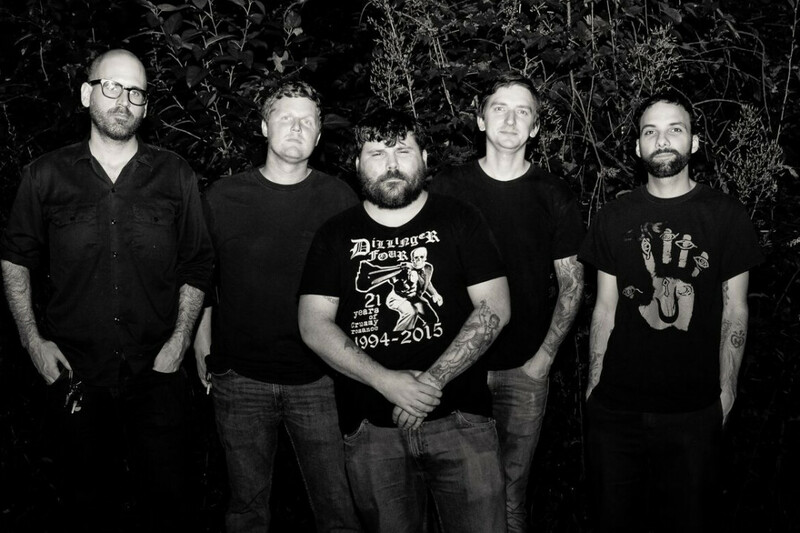 Punknews contributing writer Mike Musilli had a chance to chat with singer Jason Lubrano about the new record, touring, existentialism, and more ahead of their appearance at the 77’ Montreal festival. Iron Chic’s touring schedule for You Can’t Stay Here seems more consistent than with earlier releases. How have the tours been? Does the touring schedule grind on you at all? Yeah we’ve definitely been able to get out more and properly support the new record and we also got the opportunity to tour with some great bands that we couldn’t pass up. The tours have been really great overall. There are always ups and downs but we really can’t complain in the end. It can definitely be a grind at times but it helps that we all really love playing and we are all super grateful to be able to do it as much as we do. It is always nice when we get back home for a bit and can decompress and spend time with the people we care about, though. Do things feel at all more comfortable for you and the rest of the band given the types of tours you’ve been doing this year? In some ways things can feel more comfortable for sure. DIY shows and shows at larger venues all have their own rewards and challenges but at the end of the day it’s still, and will essentially always be, a bunch of people trapped in a van for hours at a time, long drives and not sleeping in our own beds. So three full-lengths, three different labels. How has it been working with Side One Dummy? How hands-on are they in terms of the band? It was really great working with the Side One Dummy team leading up to and following the release of the record. They worked really hard to help us get the record out and in people’s hands that might not have been exposed to us before, especially Jaimie and Christina. I don’t know that hands on is really the term I’d use but they definitely did a lot to help us while giving us room creatively to do our thing. The people who we worked most closely with at Side One are no longer there so we are a little unsure about how things will go there moving forward so we will just have to see what comes. You Can’t Stay Here seems at once a continuation and a reimagining of the Iron Chic sound. What was the song-writing process like for this record? Were there any conscious efforts to push the band’s sound into newer territory? We wanted initially to make a more poppy record overall but we had also had a very heavy and emotional couple of years before and during writing it to draw from which pushed things to a darker place than we had originally intended but became something we were very happy with in the end. Lyrically you seem to consistently find yourself exploring existential ideas from “Time Keeps on Slipping…” to “Spooky Action at A Distance” to “Ruinous Calamity.” Does the philosophy itself interest you or do your ideas just sort of coincide with existentialism? I haven’t really studied philosophy or science extensively but I have an interest in both and especially where they intersect. The more you pull back the veil of knowledge and the further you widen your observation the question of “why?” becomes both more urgent and more seemingly unanswerable at the same time. My mind often wanders into that space when all the horrors of the world become too unbearable to think about. Wondering what happens to us when we die and what our purpose or place in the universe are pretty universal questions and can be an interesting skeleton to frame an idea on, that hopefully many people can relate to no matter their identity or situation in life. If I’m correct, you also create visual art. How did you develop an acumen for that medium? What are Iron Chic’s touring plans for the rest of the year? We’re taking a little bit of a break over the summer before we head out for another short stint with the legendary Propagandhi and make our way to the Fest in October. We’re still working out what comes after that. Favorite place to play outside of Long Island? It’s really hard to pick one in particular but Chicago has always been really good to us. Getting to play Europe and other faraway places is always exciting too.